Possibly the original potatoes I planted! Until the two soul-destroying heavy falls of hail mulched them, followed by those nasty little sucking insects. Anyway, a recovery plan has helped get most of the bags looking reasonable again but they still haven’t flowered. Under instruction and many words of encouragement, I have dug out one of the bags and found 8 small potatoes (250g to be precise). I hope these are more than I originally planted but fear they may be the same ones! Royal Blue. Needless to say, the potato planting efforts have been a disappointment. I’ve put a lot of care into them for little return. The bags have also not been an outstanding success and look as though they are tearing the first year. This was the sickest looking bag, so I’m hoping for a little more from the others but am not overly optimistic. On the other hand, some of the veggies are being wonderful. Probably one of the things better than picking, cooking and eating your own veg is being able to give them away. I have a lovely neighbour who has made me feel part of the community from day one and always seems to appreciate some home-grown veg (or she is being extremely diplomatic). 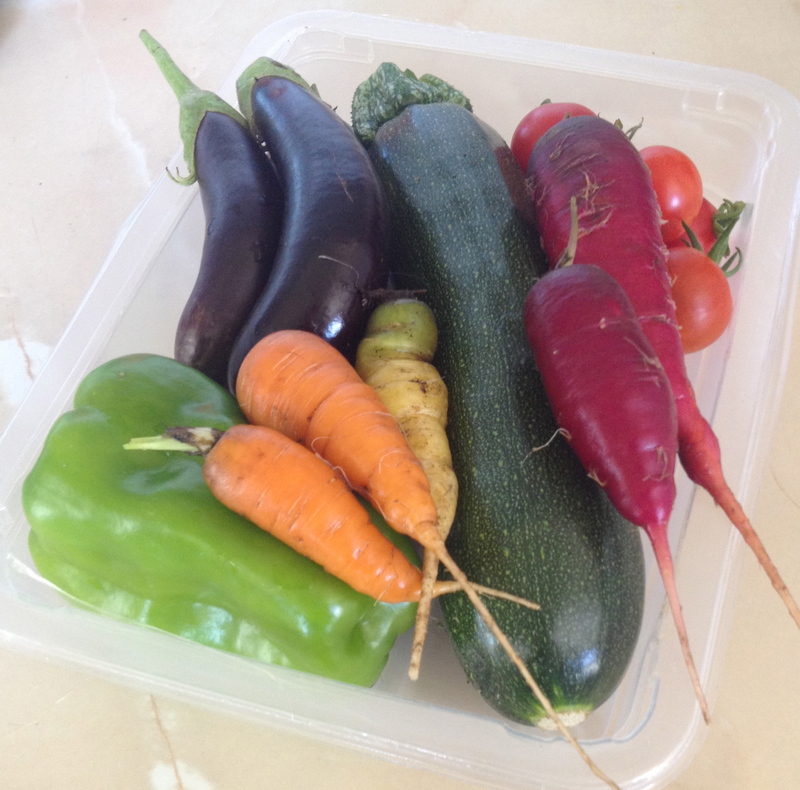 A small mixed tray including harlequin carrots, lady finger eggplants, zucchini, cherry toms, onions and capsicum looked cheerful on a hot summer’s day. I won’t give up on potatoes but will definitely adjust my expectations and approach. Something tells me that the self-sown ones from the compost that have popped up in one of the garden beds may provide better results than all my efforts. I’ve mentioned from time to time that I was planning to grow potatoes. I now have the stock to plant. I know you can just use ones from the supermarket but given this is my first effort, I thought I’d do it properly (and the proper seed potatoes aren’t prohibitive in cost). I always loved it when my father-in-law would drop off some of his latest crop but never previously had the space to grow my own. 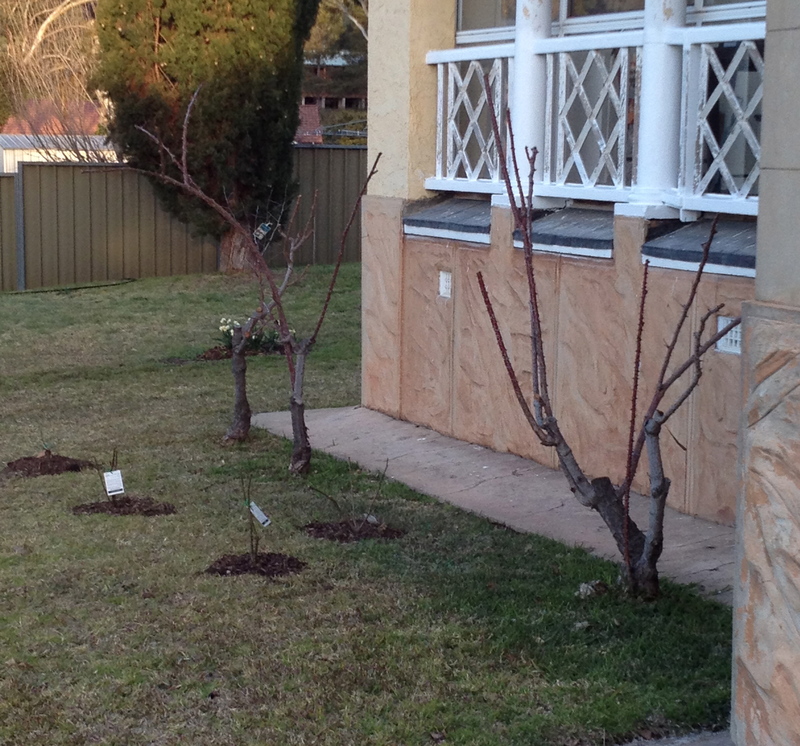 My first effort will use special potato growing bags – they are not expensive and most of mine have come from Bunnings. They are reinforced heavy plastic type sacks with a velcro pocket so you can access the potatoes from down low. 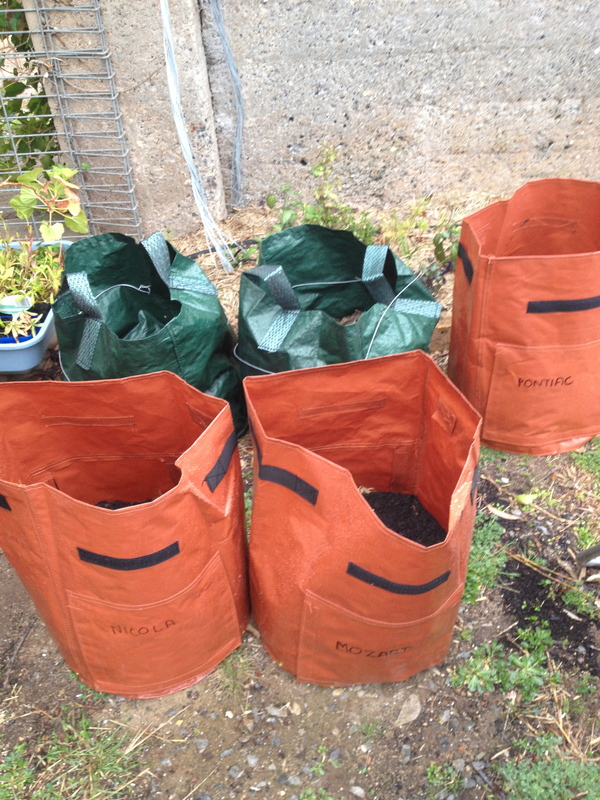 The bags are partly filled with good compost and the seed potatoes planted and covered. 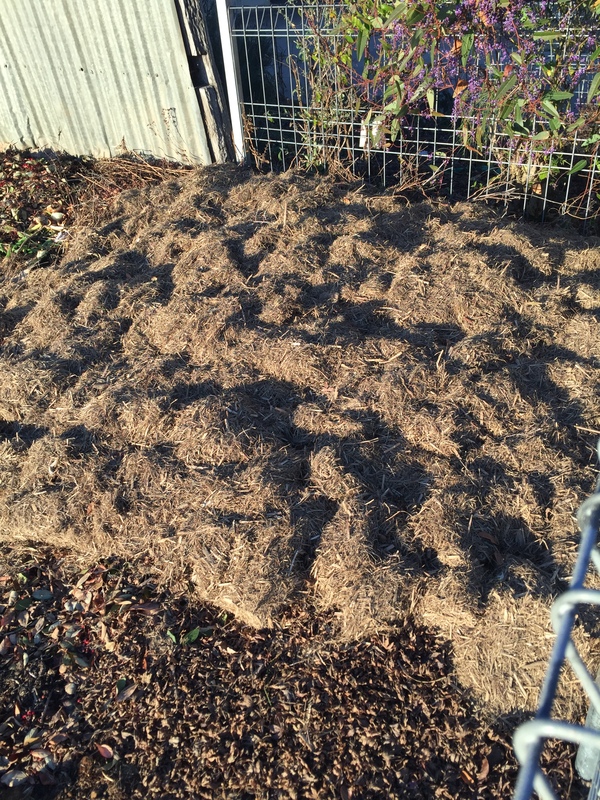 As they grow, you cover any growth with more compost. 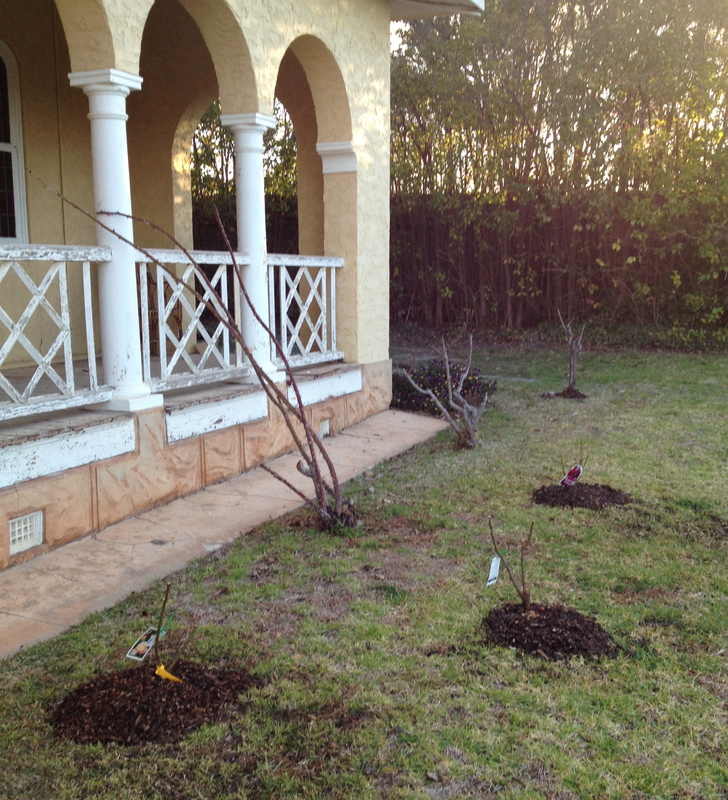 That’s where I’m up to – actually just the planting. First step is to “chit” the pototoes when you leave them in a protected sunny spot to start shooting prior to planting. Desiree – Waxy pink/red skin and creamy yellow flesh – a versatile, fairly waxy variety which is firm and holds its shape and useful for all methods of cooking; from roasting to mashing and salads. One of the common supermarket potatoes. 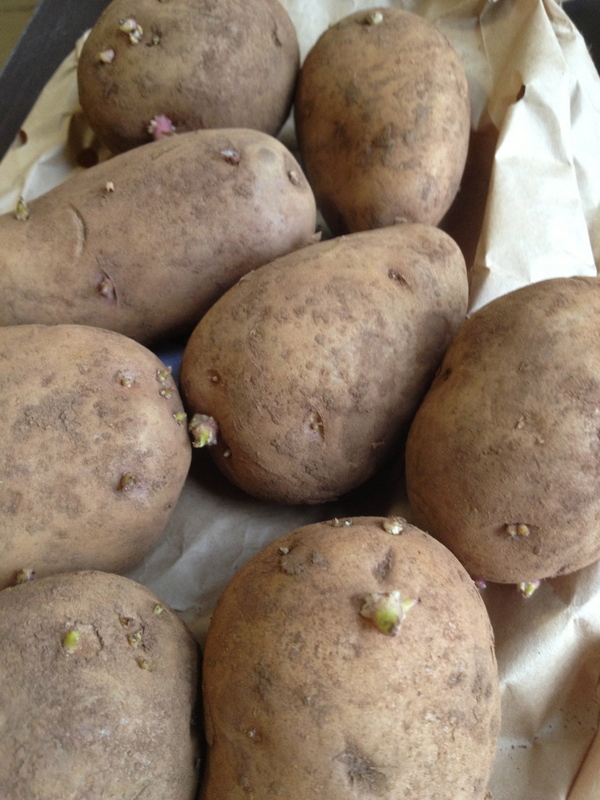 Pontiac – Another of the more common varieties – Pink skin and white flesh A good general purpose spud. Nicola – Yellow flesh. Excellent for mashing and gnocchi and good for boiling, chips and roasting. It has a very buttery flavour. Looking forward to using this after my gnocchi cooking classes. Kipfler – Currently very popular. A waxy, finger shaped with creamy-coloured flesh. Great boiled, steamed and in potato salads and for presentation purposes. I’ve also had it deep crispy fried for chips (like crispy parnsip chips) which were wonderful. Dutch Cream – Delicious potato with exceptionally creamy flesh that is perfect plain boiled or baked. One of the best for roasting. King Edward – This heirloom potato raised in 1902 has stood the test of time. Creamy flesh and skin dappled pink. Great for boiling, chips and mash. Unbeaten for roasts. 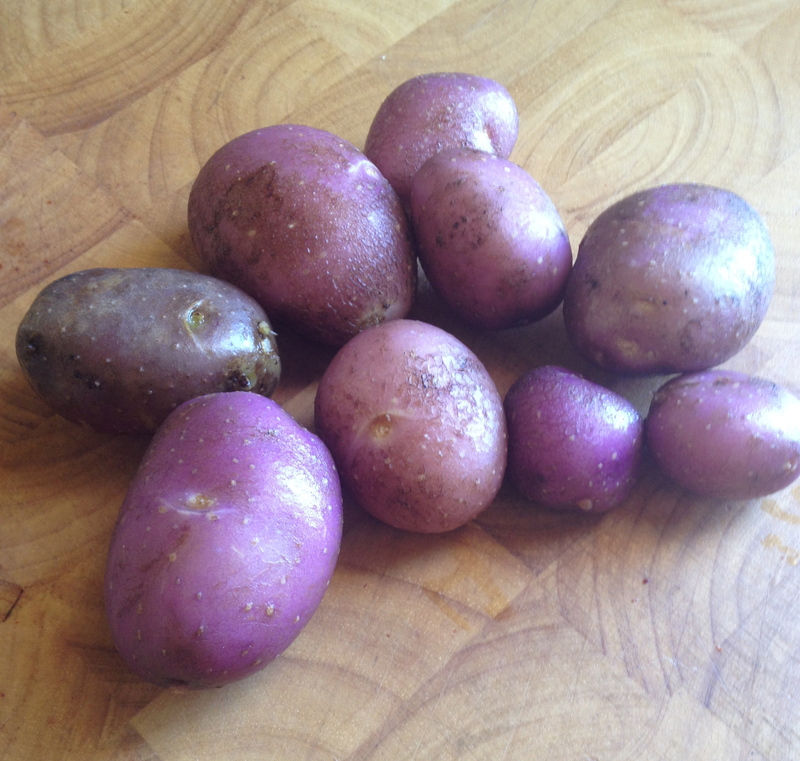 Mozart – Golden yellow flesh, that needs no additional buttering, makes one of the best baked potatoes. Flavoursome firm red skin makes it a good keeper with good disease resistance. Royal Blue – Royal Blue skin fades to golden brown when made into chips. Creamy yellow flesh ensures delicious mash. Wonderful roasted. New Zealand Yams – Despite being claimed by the Kiwi’s, Oca has long been cultivated by the Andean Indians as a staple alongside potatoes. Cook like potatoes by boiling or roasting, or eat raw after ‘sweetening’ in the sun for a few days after harvest. Flavour is nutty slightly acidic. Other than the first two, the pototoes came from Diggers. The following websites have great information on the different typs of potatoes. There are plenty left over which have gone to local friends.I don’t think there will be a potato shortage in Kandos this year. I’m looking forward to experimenting with the different varieties. My ‘tatie bags labelled and planted. There are a few more still to be set up. 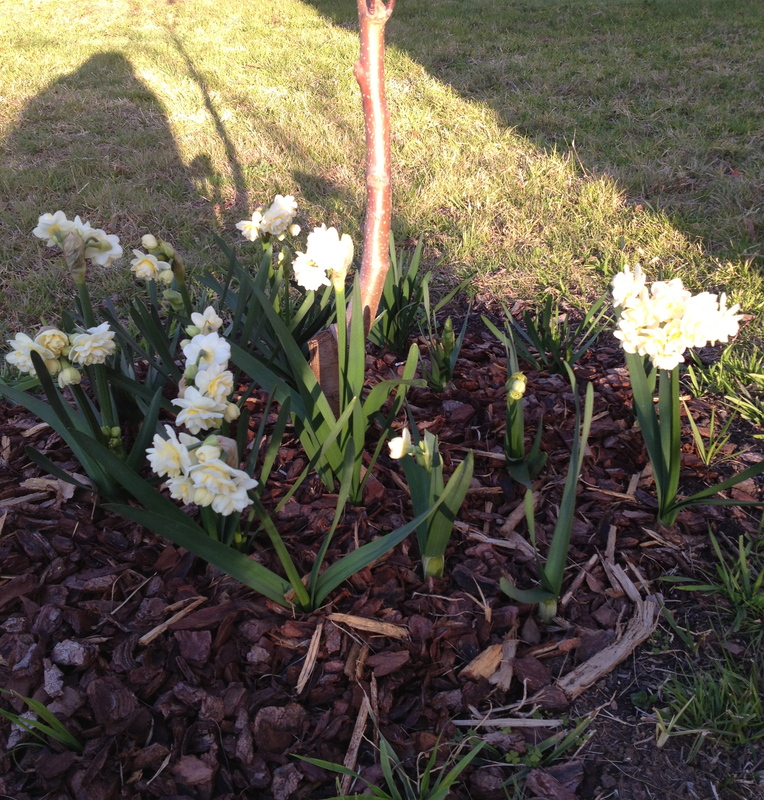 Garden Progress in August – bulbs and the beginnings of roses! The garden bed off my verandah. Enjoying seeing the initial blue, white and pink coming together, albeit little is flowering. The Fairy rose is proving to be one of my favourites and I think we will see more of her. The bulbs have been great value. At a time when so little else flowers, the bulbs are not just cheery, but always a surprise and at times spectacular. 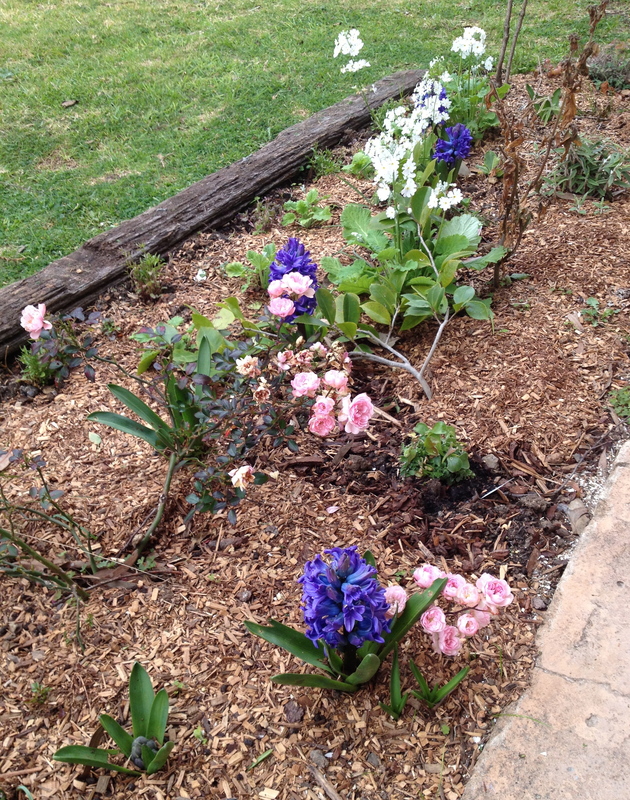 I look forward to adding more (why didn’t I plant any Bluebells?) and seeing my foundation bulbs naturalise and multiply over the years. I’m also starting to see the importance of colour placement. No mistakes so far, but it is rewarding when colour schemes work in practice. 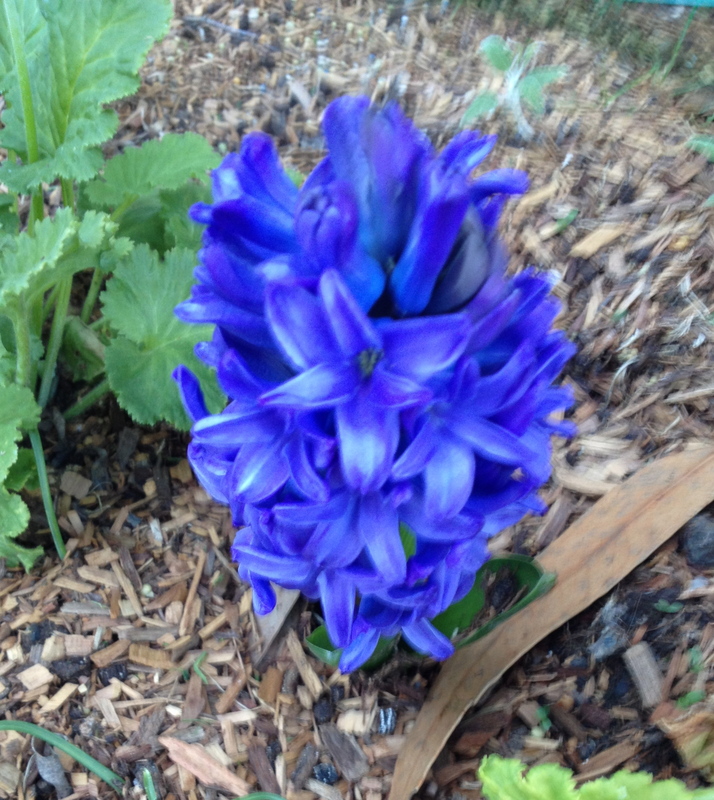 This week the Hyacinths flowered. Last weekend there was just a hint of colour in tight tucked-up buds. This weekend was a spectacular show. They must have popped up so quickly. I bought these from Tesselaars and deliberately chose blue but had no idea how deep and vibrant they would be. 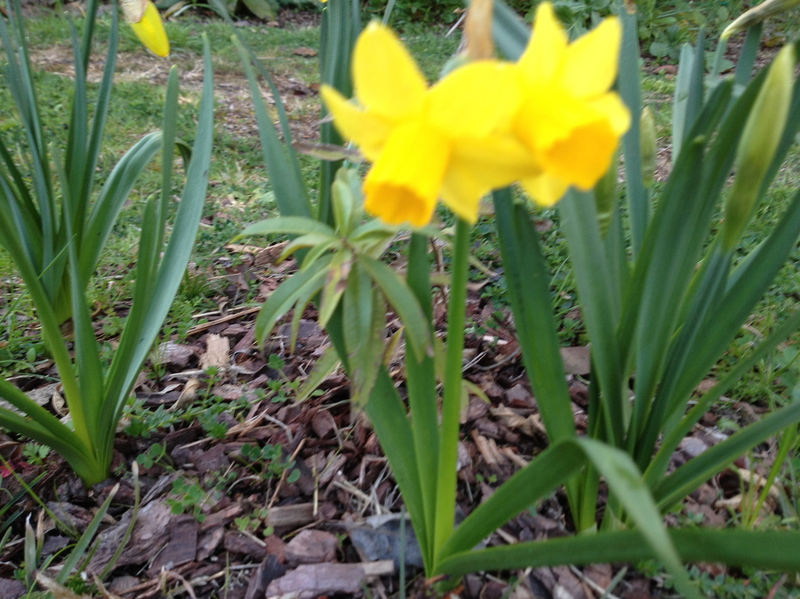 The Daffodils are growing and many are flowering. I chose a few different varieties which all seem to be thriving. The Snowflakes are always a delight and have been the first up and are still going strong. The Freesias all have lots of buds but are not quite there yet. I’m looking forward to them as they are spread under the Catoneaster. As for the roses, well after pruning all the old ones back hard last weekend and planting six standard Icebergs, this weekend I planted eight new roses, mainly from bare root stock (yes, I’m learning terms and actually doing this stuff). Most are classics and I try to keep the list updated on an earlier Rose Blog. I’ll slow down on the roses soon, but still need to get a few more “Saint” ones to finish off the collection (at least for this year). I can’t imagine i won’t always have new ones I want to add as I learn more (two serious Rose books are on their way from Amazon). I’m also ready to commence planting the long awaited ‘taties. This weekend I only started with Desiree in a potato bag, but also have Pontiac ready to go. You need to have some growth from the ‘eyes’ and I’ve left Nicola, Kipfler and King Edward potatoes in a nice protected sunny spot in the kitchen so hopefully can get some more bags started. The other notable editions were two Asparagus crowns and two Rhubarbs in the side ‘Pumpkin Patch’, which is now a healthy mulching zone. I’d like to think I will slow down soon, but know that I really want to get the front wall garden bed more established … and the weather is so good, it’s easy to spend time out in the garden. The dogs also spent all weekend outside with me, although I tend to think that Tango was more interested in the Dynamic Lifter. I know the roses will be rewarding just like the bulbs in that the new growth and flowers are so obvious to watch develop. I keep being told you can’t kill a rose. Fingers crossed I won’t be the exception to the rule. I look forward to the time when I post the blooms from each of these.